Having worked in the Willamette Valley in Oregon since 2012, I am often asked, “Where would you go if visiting the Willamette Valley?” My answer generally will include places that I know that person is likely to enjoy. However, if it were up to me, I would have some specific, special recommendations. Here are a few of my top recommendations. Tour companies: Either select a designated driver or take a tour. While tours aren’t cheap, they generally are cheaper than a DUI ticket, and they are much more enjoyable because everyone can drink. Tours also generally include the tasting fees (depending on the winery, $15-$20 per person), but check with the company when you are booking your tour. For groups of 4+: Grape Escape – Ask for Ralph, and he will take great care of you. This is probably one of the best deals out there. Furthermore, if your group isn’t big enough and you don’t mind going with others, it will likely be even cheaper. The tour guides are very knowledgeable. While you will be riding in a large 10-passenger van, they pay the tasting fees and include small snacks such as meat and cheese plates for you to enjoy at one of the winery stops. Let Ralph know where you would like to go and let him know what places I recommended. He’ll do his best to set everything up in advance for you. I consider this a no-nonsense tour with great staff and service. They will also pick you up from your hotel in downtown Portland. For couples 2-4 people: Oregon Select Wine Tours – Ask for Jeff. Jeff has been giving tours for a very long time, though you wouldn’t guess it since he’s a young entrepreneur. With Jeff’s beautiful SUVs with leather interiors, you will be riding around in style. Jeff works with a lot of the hotels in wine country, so if you are staying outside of Portland and at the Allison Inn and Spa or the Black Walnut Inn, I would recommend contacting him. If you are looking for a nice anniversary or couple’s weekend with class, Jeff is the way to go. He also said he would honor a six hour tour at the price of a five hour tour, so make sure to mention that I sent you. For younger groups of 6-12: Wildwood Adventures – Ask for Maria. Maria and her husband started this company this past year and have seen tremendous success with the younger, more active demographic. It probably helps that they both came from Nike before they decided to drop everything and follow their dreams. They have a winning combination of wineries to which they like to take their folks, but if you specifically want certain places, let them know. Here are some of the wineries that I traditionally recommend visiting whenever people ask me. Picking my favorites is always so hard, since so much depends on the person who is asking. Following are places where I would spend my day with my dearest friends. I generally like to stick to four wineries maximum as more than four becomes too much and I’d rather enjoy each winery than rush to the next and to the next. Wineries these days are opening earlier and earlier; some open now at 10:00 a.m. Make sure to check their hours, and, if possible, book a reservation. Avoid Mondays because most wineries are closed then. Some wineries also have limited hours during the fall season. Generally, I prefer to visit when there is less of a crowd, so I recommend visiting on Tuesdays, Wednesdays, or Thursdays, if at all possible. Your doing so is generally not expected, but it is appreciated, and you will also get the best service if you do this. Bubbles: Always start with bubbles. Argyle Winery in Dundee is always my first stop, I love their Pop tasting menu, which features all sparkling wines. You are sure to enjoy them. History: Try a few Rieslings and Pinots from one of the most historic vineyards in the valley: Hyland Estate. Brady, Michael, or Hannah will take incredible care of you. Let them know I sent you, and they will honor a two-for-one tasting. Red Hills Market for some stone-fired pizza and a beer on tap, and, at the same time, rub elbows with winemakers and vineyard managers from nearby wineries. Enjoy a Pinot Burger at Dundee Bistro with some truffle fries! One-on-one with a view: Enjoy an incredible view and top-rated wines, with a private one-on-one tasting, at either the Dusky Goose (closed Tuesday and Wednesday) or Soter. Both have world renowned winemakers and have some of the most beautiful views in the valley. Make sure to call ahead to set this up; you won’t be able to get in by showing up. Traditional and on the way back into Portland: Visit one of the most established wineries in the valley: Ponzi, Adelsheim, Archery Summit or Bergstrom. Be aware that these are well-visited places, and a phone call to them the day before will go a long way. Also, tasting fees may be higher depending on the location. Sometimes the fees are waived with a purchase, but each place is different, and this shouldn’t be expected. While there are so many more that I could visit, reducing this list to only a select few wineries can be hard. These are my personal recommendations and generally where I personally would take my friends visiting from out of town. Every year there are new wineries opening up and this list may change over time but it serves as a good base to plan your trip. Visiting during the summer can be a busy time to visit but the weather couldn’t be better. Spring and Winter may be wet but you have less tourism traffic and have a chance to do more one-on-one tastings. I personally prefer to go in the middle of the week and in the Spring or Winter time as this gives me a great opportunity to learn as much as I can from the staff and have a more dedicated tasting. At the end of the day, if you haven’t already purchased a case of your favorite wine but instead picked up a few from each location, The Newberg Mailroom is where you’ll want to stop and drop your wine off to have shipped to your final destination. Sometimes you can ask your tour operator when scheduling your tour that you may want to do this at the end of your tour and perhaps to do this quick stop for you. I would recommend filling a case of 12 bottles because it won’t matter whether you send 6 bottles or 12—the shipping cost will generally be the same. If you are flying with Alaska Airlines, there is a special program called Oregon Wines Fly Free. You can see the details at: http://www.oregonwine.org/oregon-wines-fly-free/. If you are planning your trip, take this into account, because sometimes shipping wine can otherwise be expensive; thus if you can just take it with you, I would recommend it. If you do decide to ship your wines yourself, just make sure you get the right packing material, either from a winery or from the Mail Room in Newberg. To learn more about Oregon wine, make sure to check the Oregon Wine website which is full of events and promotions in the state. Enjoy! If you enjoyed my recommendations, feel free to share them with others, and let me know if you enjoyed your tour. Cheers! Portland is a city of food, craft beer, and wine. It is a place to ride a fixie bike and to ride the public transportation system instead of driving your car, a place where being green is the only color to be, a place where there is craft coffee, fancy donuts, crazy soccer fans, beard-toting men, and amazing cider—all in one city. Taking one of these tours is probably one of the funnest things to do with a group of your friends through Portland! What would be better than drinking beer, blasting music, and riding bikes through a sunny afternoon in Portland? We got together a group of six of us and mounted a BrewCycle bike with friends for a tour of three breweries in the area (see photo below). Well worth the $20 per person! Be prepared to pay for your own happy hour priced drinks, and to have a great time! Brewcycle Madness: The More the Merrier! Visiting Wine Country with Friends and a great DD! Science is fun! Can you imagine being able to shoot off a water rocket, microwave a light bulb, and build a Roman Arch with your friends while enjoying some great beer and wine at night? This event is held once a month on Wednesdays from 6-10 p.m. The museum picks a theme and sets up a number of really interesting hands-on science experiments that you are sure to enjoy. Make sure to check their schedule here for the next event. Some claim that this is America’s version of European soccer fanaticism—II couldn’t agree more! I have sat in numerous seat locations—from ones right on the center midline, so close that I could touch the players as they were doing a throw in; to ones on the side, where you can get the best overall view of the game; to the famed Timber’s Army seats. I have to say, my favorite by far have been the General Admission Timber’s Army seats. These seats allow you to feel like you are a part of the game with the chanting, jumping, flag-waving community that surrounds this home soccer team. At about $25 a ticket, you really can’t go wrong. Just be prepared to stand, sing, and yell as others stand, sing, and yell with you: LET’S GO TIMBERS, LET’S GO! 5. Visit a Food Cart Pod and eat it all up! You can’t leave Portland without having eaten at a Portland food cart. There are over 500 food carts throughout Portland. Not only are food carts a great place to try native foods from around the world, they are also safe and authentic. This is where top chefs or soon-to-be top chefs experiment with an idea, and if it takes off, they decide to expand it to more food carts or potentially to brick-and-mortar locations. Food carts are always an experiment in entrepreneurism, low overhead, and passion. Some stay, some go, some move. Look them up before you hit the streets. Nong’s Khao Man Gai, which now has become so popular for its Thai chicken over rice. This plate comes with a phenomenal ginger, soy, and chili sauce called Khao Man Gi sauce. Nong came to Oregon with $17 and two suitcases; she worked in the restaurant industry until, in 2009, she decided to open her first food cart. A Bangkok native and now Oregonian, Nong now has two food carts and a restaurant. I love her food! Below you will find a video on how exactly to eat her great food. Gabagool, if you love italian food, you will love this place. I have been so impressed with their Piadina Sandwiches, especially its namesake, Gabagool Piadina. I have yet to try their homemade pasta, but if it’s as tasty as their Gabagool Piadina sandwich, I won’t be disappointed and neither will you. Koi Fusion, the place where you can get Mexican and Korean in one amazing fusion meal. Having initially started with one food truck, the owners now recognize the balance of having not only food carts but multiple stationary (brick-and-mortar) locations. There are now six stationary and six mobile locations throughout Portland, so you are destined to run into one. I personally love their kimchi and would add it to every single item on their menu. No matter what neighborhood you stay in, there is likely a food cart pod ( a number of food carts all in one area) in your area. Click here to find one near you. To find out more about all the fun things to do in Portland, check out Travel Portland online. At that website, you can book your hotel and tickets through their concierge staff and receive discounts to all kinds of great events. As part of my Unique Portland series on things that make Portland strange, different, and wonderful, I had the chance to sit down with Sasha and Michael of Cyril’s at Clay Pigeon Winery for an interview about how to bring two passions together into one location. 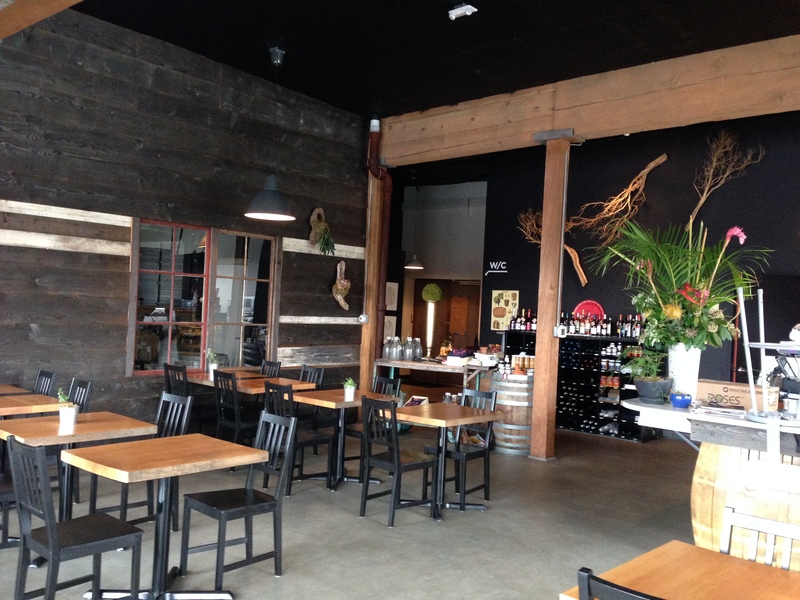 Learn here all about Sasha and Michael and their adventures in creating a successful Portland Urban Winery and Restaurant: Cyril’s at Clay Pigeon. Sasha, a self-proclaimed cheese BFF (best friend forever), and Michael, a wine connoisseur and now winemaker, have created a great place. Clay Pigeon, an urban winery run by Michael in Southeast Portland, specializes in Pinot Noir and Syrah wine from this great state of Oregon. Cyril’s, run by Sasha, is the restaurant, wine bar and tasting room. Michael started Clay Pigeon originally in their basement in Portland; when they found the right space, they moved the winery to where it is today on Oak Street, on the other side of the wall from Cyril’s. The Fixe lunch of your dreams! Eggplant Involtini with a glass of Bourougne Chardonnay. Make sure to check out Cyril’s Fixe lunch menu, which is priced at $14-$18 for a three course European-style lunch. You choose whether you’d prefer a glass of wine with your meal or whether perhaps you’d rather have a sweet finish with a delectable dessert. Check back every week as the menu changes. This is comfort food to the extreme. You can’t help but leave here with a full belly and a content heart. Cyril’s is open Monday through Friday for lunch, and it is open for dinner Tuesday through Saturday. Because we live in this phenomenal foodie town, there is a time, once a month. when over 30 top-notch restaurants offer varying three-course meals throughout Portland for a mere $29 per person. Cyril’s is also a part of this great culinary event. While you are at Cyril’s, I would highly recommend tasting their Sunshine Salad and cheese boards and enjoy a glass of Michael’s very own Clay Pigeon 2012 Syrah. At this link you will also get a chance to view the bottling of this beautiful Rogue Valley Syrah. 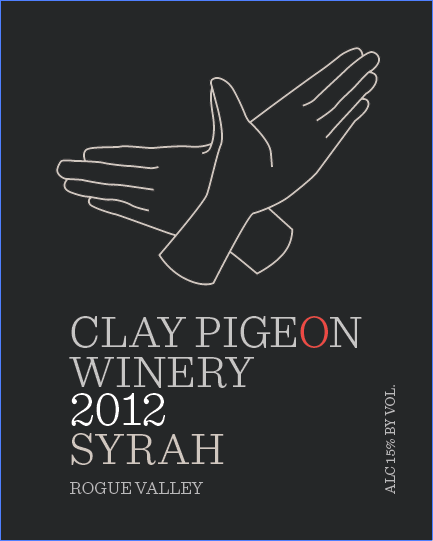 For more information: visit Sasha and Michael at www.claypigeonwinery.com/ and www.cyrilspdx.com. April Yap-Hennig is a wine lover and marketer with 12 years of experience in International Marketing and Communication in Europe and the United States, and life experience also in the Caribbean and South America. She holds a Masters in Viticulture and Enology from the University of La Rioja, Spain, an MBA from Purdue University, and B.A. from University of Utah. She is also a Certified Wine Sommelier from the International Wine Guild in Colorado. April was born in Utah, raised in the Dominican Republic and Ecuador and has lived and worked in The Netherlands, Germany, Switzerland and Spain. Her love of wine started when she studied in La Rioja, Spain during her undergraduate studies. This is where she fell in love with the country, the region, the people, the culture, and finally the wine. Thus changing her life and eventually her career. She is now the co-founder and owner of Epicurean Media, a beverage and food artisan public relations and marketing consultancy as well as writes for the Sacred Drop Channel at www.sacreddrop.com. She is forging a new future in Oregon with her husband and their hilarious French bulldog, Guapo. Check out her websites www.about.me/aprilyaphennig and www.epicureanmedia.com.